A lever is something you need to push up and down in order for it to work, and a lever handle lock is a type of doorknob or locking system that requires you to move the lever handle in order for the door to unlock. There are many advantages to this type of system for home or office and you will need qualified service to do the job right. 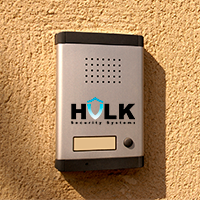 Hulk Security Systems serves all of NYC with security systems from Manhattan to Staten Island, The Bronx, Brooklyn and Queens. We offer complete security solutions for homes and businesses. One thing to consider is that a lever handle lock is very attractive. It can add some style to your doors and your space overall. The handles you see on French doors are a type of lever handle lock, and using these on all your exterior doors can give your home an updated yet traditional and welcoming feeling. Another consideration is that a lever handle lock may work to unlock a door when you move the handle. Some doors have this set up so that you don't need to actually unlock the door on the inside, but can simply turn the handle on the inside and the door unlocks. This means less fumbling with the lock, which is ideal for businesses. This type of lock does not compromise the safety of the space as you cannot unlock it from the outside but it can be opened from the inside. This is a basic and practical part of business security. These lock systems allow privacy in businesses meeting rooms as well and they secure areas where only certain personnel are allowed to enter. Internal business security is just as important as external security.